Spring Promo! 25% Off Online Orders! Quality seafood deserves the very best! Kelchner's Cocktail Sauce. A rich, chunky texture with a zesty tomato bite and a subtle but punchy horseradish finish. Kelchner's Horseradish Remoulade. Try this delicious dipping sauce for breaded seafood and french fries or as a topping on roast beef. Enhance your next meal with Kelchner's Honey Ginger. Try as a marinade or topping for salmon, chicken or veggies. Quality seafood deserves the best why not try it with one of our new sauces & marinades. 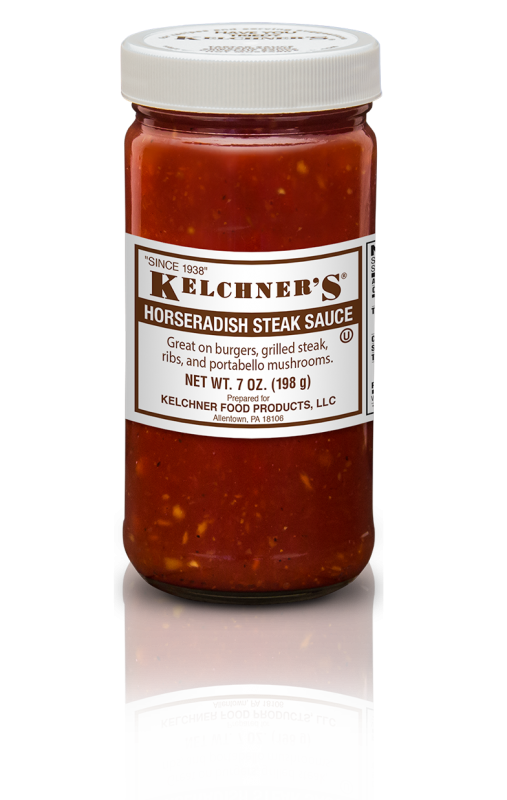 Leftovers will never be the same again with Kelchner’s Horseradish Steak Sauce. Explore our bold and flavorful recipes! Find the perfect recipe for your next party, or family gathering. Since 1938, Kelchner’s Horseradish Products has been producing Horseradish, Cocktail Sauce, Hot Mustard with Horse-Radish, Tartar Sauce and Horse-Radish with Beets. Adhering to old family recipes and attention to freshness, we produce the finest condiments known as traditional favorites in Pennsylvania and the Mid-Atlantic region. We find new consumers quickly making us their favorite and we trust you will enjoy our products too. I LOVE your products... I recently was in the Ocean City, MD area and purchased several jars of your products at the local Superfresh to bring back to NC! yum!! Keep up the good work! Apr.21.2019 Happy Easter from our Kelchner family to yours!